1237 Death: Jordanus of Saxon, second general of Dominicans, by drowning. 1440 Birth: Hartmann Skull, German physician, humanist, historian. 1542 Death: Katherine Howard, fifth wife of Henry VIII; beheaded. 1601 John Lancaster leads the first East India Company voyage from London. 1622 Birth: Adam Pijnacker, etcher, landscape painter. 1635 The Boston Latin School; the oldest public institution in America. 1678 Tycho Brahe first sketches his 'Tychonic System' of the solar system. "In order to account for the observed proximity of Mercury and Venus to the sun, Tycho postulated a system in which those two planets orbited the sun, which in turn orbited the earth outside the sphere of the moon but inside the spheres of the outer planets. Tycho thus maintained the traditional post of the earth at the center of the universe but broke with tradition in discarding solid crystalline spheres." 1689 William and Mary receive from the British Parliament the basis for the constitutional monarchy; the Bill of Rights. 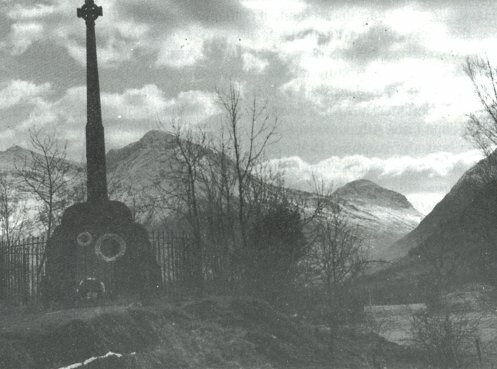 1692 Glencoe Massacre: At King Willem III's instigation, the MacDonalds are massacred by their traditional enemies, the Campbells, in the Scottish Highlands. 1682 Birth: Giovanni Battista Piazzetta, in Venice, painter. 1741 The first issue of American Magazine is published by Andrew Bedford; the first American magazine. 1764 Birth: Talleyrand; Napoleon's foreign Minster. "...His part in the XYZ Affair and his endorsement of Napoleon's plan for seizing Egypt in 1798 had unfortunate consequences for France. In July, 1799, he resigned his post, only to resume it after helping Napoleon gain power under the Consulate (Nov., 1799). He helped to bring about the Concordat of 1801 with the Vatican, shortly after which the ban of excommunication against him was lifted (1802). The following year he was appointed to the lucrative position of grand chamberlain under Napoleon, now emperor, who in 1806 created him prince of Benevento. Napoleon tended more and more to ignore Talleyrand's cautious advice, and the split between the two widened as Talleyrand tried unsuccessfully to restrain Napoleon's ambitions..."
1768 Birth: General Edouard Mortier, French prime minister, 1834-35. 1777 Marquis de Sade is arrested without charge, and imprisoned in Vincennes fortress. 1795 The University of North Carolina opens; the first state university in the US. 1798 Death: Wilhelm H. Wackenroder, German writer; Fantasies of Art. 1799 Massachusetts passes the first US law regulating insurance. 1805 Birth: Peter G.L. Dirichlet, in Germany, number theorist. 1809 The French take Saragossa, Spain after a long siege. 1829 Birth: Gerard Keller, writer, Netherlands Spectator. 1837 A food riot occurs in New York City over the high price of flour. 1849 Birth: Lord Randolph Churchill, in England, politician, Winston's father. 1852 Birth: Johan L.E. Dreyer, Danish astronomer; New gen catalogue of nebulae. 1859 Birth: Franc Van de Goes, writer, Marxist theorist. 1862 US Civil War: Feb 13-16 The Siege of Ft Donelson in Tennessee begins. 1866 The James Gang raids their first bank, in Liberty, Missouri, stealing $150,000. 1883 Death: Richard Wagner, at 69 in Venice. "Richard Wagner was the most politically incorrect composer in history and also was one of the worst anti-Semites of the 19th Century...Wagner lost no opportunity, year in and year out, of fretting the life out of his Jewish friends and collaborators about their Judaism. When Levi, a Jewish conductor, conducted the world premiere of his opera, Wagner remarked that if he were playing in the orchestra he wouldn't like to be directed by a Jew. Richard Wagner was the unofficial court composer of the Third Reich. Adolf Hitler said that "Whoever wants to understand National Socialistic Germany must know Wagner." Hitler's appropriation of the Bayreuth Wagner Festival was to serve his own cultural propaganda purposes. Wagner was a cultural hero for Hitler and his Nazis. 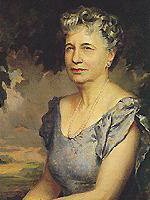 The strains of Wagner were played during the Nazis' book-burning ceremonies and when concentration camp prisoners were about to be put to death..."
1885 Birth: Bess Truman, wife of President Truman, first lady, 1945-52. "...at 117 West Ruby Street in Independence, Missouri. The oldest child of David Willock Wallace and Madge Gates Wallace, she was christened Elizabeth Virginia, but throughout her life was called Bess. Her father held several public offices, including County Treasurer, and was Deputy Surveyor in the Kansas City office of the United States Bureau of Customs at the time of his death in 1903. After her father died, Bess, her mother and three brothers moved into the house of her maternal grandfather, George Porterfield Gates, a co-founder of the successful Independence flour mill, the Waggoner-Gates Milling Company. The Gates' house, located at 219 North Delaware Street, continued to be Bess Wallace's home for the remainder of her life. An only daughter, Bess Wallace acquired a reputation as a tomboy. "The first girl I ever knew who cold whistle through her teeth and bat a ball as far as any boy in the neighborhood," said a classmate. She graduated from Independence High School in 1901 in the same class as Harry S. Truman and later studied language and literature at Barstow, a girl's finishing school in Kansas City, Missouri. After completing school Bessie Wallace, as she was often referred to in the social columns of the Independence paper, stayed at home with her widowed mother and helped run the household. In 1917, Miss Wallace became engaged to Harry S. Truman whom she had known since childhood. President Truman in his Memoirs recalls that when his family moved to Independence in 1890 his mother took him to Sunday school at the First Presbyterian Church. "We made a number of new acquaintances," he said, "and I became interested in one in particular. She had golden curls and has, to this day, the most beautiful blue eyes. We went to Sunday school, public school from the fifth grade through high school, graduated in the same class, and marched down life's road together. For me she still has the blue eyes and golden hair of yesteryear." The Trumans were married in Independence, on June 28, 1919, in Mrs. Truman's church, the Trinity Episcopal. 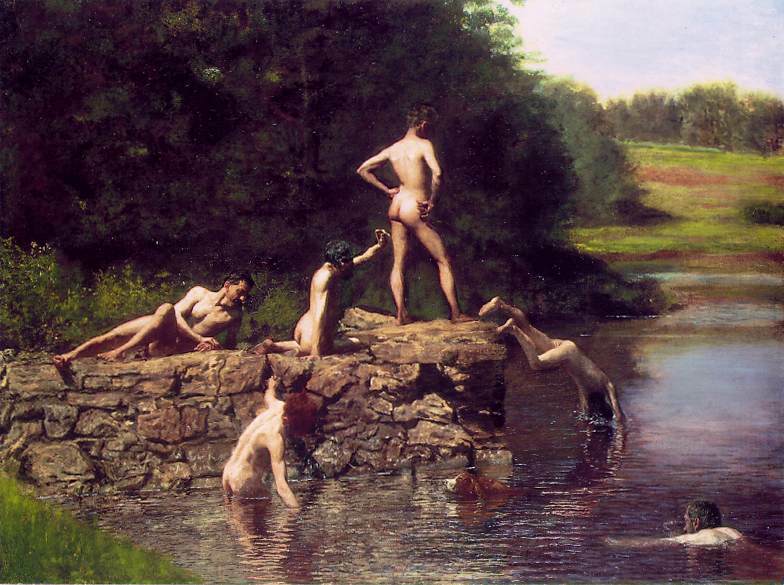 The previous month Mr. Truman had received his discharge from the Army after serving overseas in WW1..."
1886 Painter Thomas Eakins (example above) resigns from the Philadelphia Academy of Art after the controversial over use of male nudes in a coed art class. 1887 Birth: Alvin York. 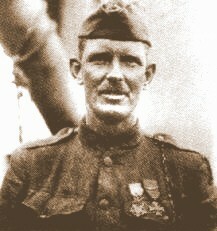 "...Known as the greatest American hero of World War I, York avoided profiting from his war record before 1939. Born December 13, 1887 in a two-room dogtrot log cabin in Pall Mall, Tennessee, and raised in a rural backwater in the northern section of Fentress County, York was a semi-skilled laborer when drafted in 1917. Quite literally having never traveled more than fifty miles from his home, York's war experience served as an epiphany awakening him to a more complex world. 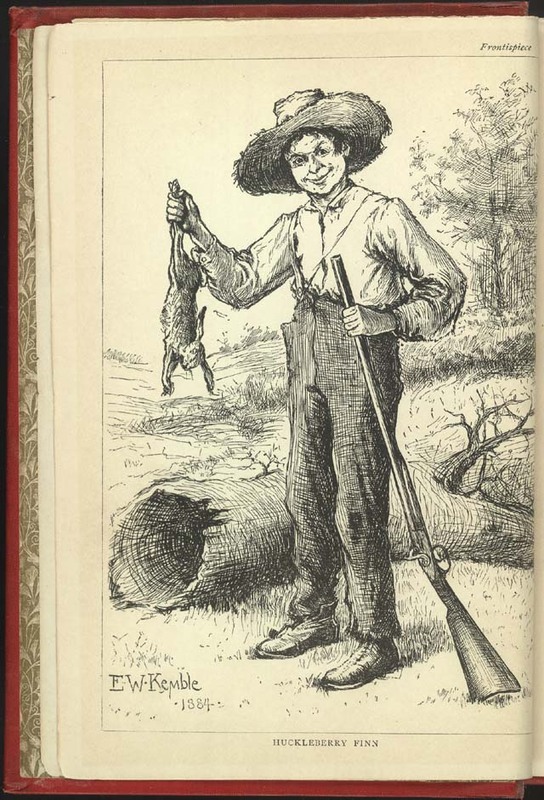 The third oldest of a family of eleven children, the York family eked out a hardscrabble existence of subsistence farming supplemented by hunting, and York became a competent marksman at an early age. Living in a region that saw little need for education, York had a grand total of nine-months schooling at a subscription school he attended in his youth. York's father, William York (who died in 1911), also acted as a part time blacksmith to provide some extra income for the family. Prior to the advent of the World War, York was employed as a day laborer on the railroad near Harriman. As a result, York had little experience with managing money and later suffered from chronic fiscal problems. (York spent money when he had it, gave it away to other people who he believed needed it, and invested poorly). As York came of age he earned a reputation as a deadly accurate shot and a hell raiser. Drinking and gambling in borderline bars known as "Blind Tigers," York was generally considered a nuisance and someone who "would never amount to anything..."
1888 Birth: Georgios Papandreou, Greek prefect of Lesbos, minister, premier. 1891 Death: David D. Porter, US Civil War Admiral, at 77. 1893 Birth: Ana Pauker-Rabensohn, in Romania, communist foreign minister, 1945-52. 1902 Birth: Karl Menger, US mathematician; theory of dimension. 1910 Birth: William B. Shockley, in London, author, US physicist (Nobel 1956). 1916 WW1: Feb 13-16 General Yudenich reaches Erzerum and breaks through its ring of forts in a 3-day battle. She was held in Saint-Lazare prison while awaiting trial and interrogated by Bouchardon no less than seventeen times before facing an actual military jury. The prison had no baths so the only way she could clean herself was in a small bowl that was sometimes brought to her cell. The institution itself was generally filthy, something that greatly distressed the fastidious Mata Hari. She was isolated from other prisoners. This may have been for her own protection since her fellow inmates may well have wanted to exact their own justice upon a German spy but it grated on the sensibilities of the extroverted suspect..."
1919 Weimar: The chairman of the Catholic Center Party deputation in the National Assembly declares that the party cannot approve of the revolutionary upheaval that has overthrown the monarchy. Note: In time the Center party will become one of the mainstays of the Weimar Republic. 1921 Birth: Zao-Wou-Ki, Chinese-French painter, graphic artist. 1923 Birth: Chuck Yaeger, famed test pilot, first man to break sound barrier. 1927 Death: Brooks Adams, US philosopher; New Empire. 1929 Birth: General Omar Torrjos Herrera, president Panama. On 7 September 1977, General Omar Torrijos Herrera and President Jimmy Carter will sign treaties giving Panama gradual control of the canal, phasing out US military bases, and guaranteeing the canal's neutrality. 1934 The Austrian government of Dollfuss bans the socialistic party. 1937 Hal Foster's Prince Valiant comic strip first appears; this superbly crafted strip is known for its historical detail. 1943 WW2: German forces make an assault on Sidi Bou Zid, in Tunisia, General Eisenhower visits the front-line. 1945 WW2: Soviet forces capture Budapest, Hungary. The Germans will suffer more than 50,000 casualties in the 49-day battle. 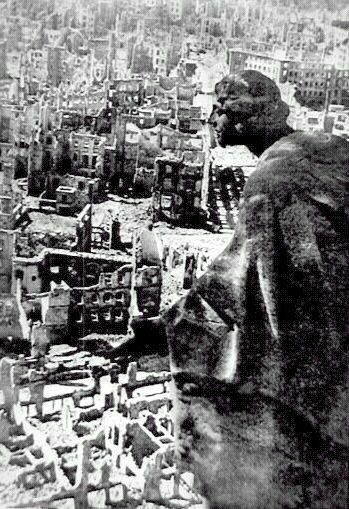 1945 WW2: 1400 RAF and 450 USAF airplanes, in three waves over a 14-hour period, fire-bomb Dresden, devastating one of the world's most beautiful cities. As many as 135,000 people are killed. 1955 Israel acquires 4 of the 7 Dead Sea scrolls. 1958 Death: Georges Rouault, French painter; Christ aux outrages. 1960 France joins the nuclear club, the fourth country, after the US, USSR, and Great Britain, to detonate a nuclear weapon. 1965 Death: William H. Kilpatrick, US mathematician, philosopher, at 93. 1968 The Nam: The US deploys an additional 10,500 soldiers to Vietnam. 1969 It is announced that eggs removed from a woman volunteer had been fertilized in a test tube as a result of research at Cambridge University. 1971 American Vice President Spiro Agnew manages to injure three spectators with his first two tee shots in the Bob Hope classic on this day. 1973 The US dollar is devalued by 10%. 1975 Cyprus leaves the Turkish-Cypriot Federation. 1976 Death: General Murtala Mohammed, head of Nigeria, killed during a coup. 1984 Konstantin Chernenko succeeds the late Yuri Andropov as Soviet leader. Chernenko will die 13 months later and be succeeded by Mikhail Gorbachev. 1990 The US, France and England publicly approve German reunification. 1991 Desert Storm: Iraq claims that hundreds of civilians were killed when US bombs hit a building in Baghdad; the United States declares that the building was a heavily fortified military command center. 1992 The UN secretary-general declares that he will recommend sending a large UN peacekeeping force to Yugoslavia, despite a thinly veiled threat by Serbian rebel leaders that they may be attacked. 1995 A war crimes tribunal in Geneva indicts 21 Serbs for crimes against humanity in the war in Bosnia, though only one is actually in custody. 1998 Cuba begins releasing 299 political prisoners following an appeal by Pope John Paul II. 1998 Nigerian troops overthrow the military junta that had ruled Sierra Leon since ousting the democratically elected government in May 1997.